Russell trained at Warwick University and the Royal Academy of Music where he performed as Anthony in Sweeney Todd. 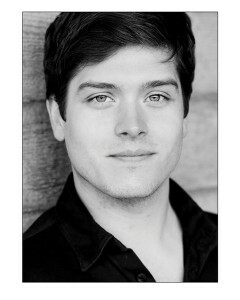 In 2005 he was one of the finalists in the prestigious BBC Radio 2’s International Voice of Musical Theatre Competition. He has appeared in many Off-West End shows including the award winning Best Off-West End Production of The Pirates of The Penzance at the Union Theatre, where he played the lead role of Frederick. Russell is now enthralling audiences in the hit musical Chicago. I hope you enjoy what Russell had to say about himself and his career. This is a bit embarrassing, but I think my inspiration came when I went to see Joseph in the West End for my 11th birthday. I guess most boys would want to have been Joseph, but I just wanted to be the Narrator. It was Linzi Hateley as the narrator and I was blown away by her voice. I used to sing all her bits from the show all the time and it drove my brother mad. He would sit on me till I stopped singing, so I would just go into the garden and carry on singing along to Linzi with my headphones on. It’s funny because I am now with the same agent as Linzi. Still not met her yet though. Probably for the best, I might get a bit speechless. Can you recall any of your earliest performances? I remember doing a production of Charlie and The Chocolate Factory for my local amateur group when I was a child, having persuaded my mum to drop me off at an audition. I wanted to be Charlie because I loved the book so much and I sang ‘Where is love’ from Oliver. To this day I don’t know where I got the balls from to do it because I had never sung before in front of anyone, but when you are young you don’t have any fear. Anyway, I got the part of Augustus Gloop! Ha! Always was a bit too well fed to play Charlie. I remember opening night very vividly because in the scene where we all entered the main doors of the chocolate factory, the man playing Willy Wonka opened the doors the wrong way, so there was just a small crack to get through. All the other children slipped through the gap and I was last. I had a fat suit on and I got stuck in the doors. It was mortifying, but they eventually dragged me through and the audience thought it was hilarious. I guess I have always liked a bit of comedy since. You trained at Warwick University and the Royal Academy of Music in London. What are a few of your favourite memories from training and how did your training help prepare you for a professional career on the stage? I have very fond memories of my training at the Royal academy. It’s an incredible place because you are surrounded daily by world class musicians and this becomes part of every project you do. I was lucky enough to play Anthony in Sweeney Todd as our final show and we had a full orchestra of some of the best young musicians around. It was an incredible feeling to sing with a full orchestra, something you don’t often get to do in the professional world. Also, I got the chance to work with some amazing people through the course. I was selected to sing for a masterclass with Julia Mackenzie. I have been a massive fan of her work ever since I got my first recording of Into the Woods, which she starred in. I decided to sing ‘No more’ from that show for the masterclass and it was such a thrill because she had me sit down cross legged opposite her and imagine she was Cinderella and I was singing the song to her. She was so supportive and I will never forget that moment. She gave me the best piece of advice I have ever had. She said, “Always keep your joy”. In 2005 you were one of six finalists in BBC Radio 2’s International Voice of Musical Theatre Competition. What was it like taking part in the competition? This was a wonderful opportunity to sing on BBC with a full orchestra. There really is nothing like the thrill of singing full pelt with that massive sound behind you. I have been very lucky and this was a highlight for me. I was fresh out of college, so a bit green and wide-eyed. The whole thing was just great. It made it all the more exciting that one of the judges in the final was Julia Mackenzie! Bizarre twist of fate, but I think I just sang everything for her and that helped with the nerves, a lot. I even sang Giants in the Sky as one of my final songs, and I had chosen this before I knew she was judging. It was a great feeling. You toured in Scrooge (UK tour) as the Young Ebenezer and as Peter/Understudy Jesus in Jesus Christ Superstar (Scandanavian tour). What do you like and dislike about being on tour and what are your favourite memories from these two tours? I love being on tour! It’s very different to working in the West End because you are all away together and it tends to be much more sociable. You really make strong bonds with those people because sometimes it can get quite hard, especially if you are touring to a new venue each week or sometimes every other day in the case of Jesus Christ Superstar. So you all become a bit of a family. Some of my closest friends, I met on these tours. It’s also a great way to see the country, and other countries. I loved working in Sweden and Denmark on Jesus Christ Superstar. Amazing memories. It was made particularly special for me because I was playing Peter, so I got to sing a duet with Mary every night, played by Krysten Cummings. I had first seen her several years before in the original London cast of RENT and thought she was incredible, so to get to sing with her every night in my first job out of college is something I will cherish. I used to stand on stage each night before the show went up thinking, “I can’t believe I am here, I must never forget this”. In 2010 you played the lead role of Frederick in The Union Theatre’s production of The Pirates of Penzance. The show won an award for the Best Off-West End production. What was so special about the play and your role? This is one of my most cherished memories. It was just one of those times when everything comes together and falls into place and it all feels incredibly easy because the team are all heading for the same goal. Sasha Reagan is such an incredible lady and she wanted to take Pirates and make it fresh. By casting the show all-male it removed the need to find comedy and bizarrely it takes away the camp element so often associated with G&S. We played it totally straight, especially me because Frederick drives the narrative so he has to believe everything that is going on whole-heartedly, even when the plot takes some bizarre twists and turns. This was the challenge. We had such an amazing group of people on that show, both at the Union Theatre and at Wilton’s Music Hall. It is the hardest I have ever worked on stage (Frederick is rarely off), but somehow it is one of the easiest experiences I have had because it just worked. In fact, it is going to Australia later in the year. Very excited about that. You have appeared in quite a few Off-West End theatres in various musicals and plays. What have been your most memorable experiences? A couple of years ago I played the role of The Diva, in a new musical called Frank’s Closet. The writer, Stuart Wood is just brilliant. He is such a generous and modest man, and he had written something that is totally unlike anything I have ever seen. It was just a celebration of everything gay I suppose, but it had real heart and the music and lyrics were so clever. I got to play lots of iconic ladies, including Judy Garland, Julie Andrews, Ethel Merman and Karen Carpenter. So much fun. I think of it like some bizarre dream. I am still not quite sure if it actually happened. You have performed in Chicago at the Cambridge theatre and now the Garrick Theatre. What can you tell us about the show? I first saw Chicago with Ruthie Henshall and Ute Lemper about 2 weeks into its run at the Adelphi. I was in love with it. Those ladies were incredible together. The whole cast were incredible and the show has such style. Even now, I still adore the score, I never tire of it. The role I play now was played then by Charles Shirvell. What a star. His performance stayed with me and no doubt it informs what I do now, but hopefully I have made it my own too. I have such fun with it. Why do you think Chicago is such a successful musical? The writing is incredible. There is nothing like it out there for showing off the talents of the band and performers on a bare stage. It’s thrilling. I LOVE to perform ‘Both Reached for the Gun’ every night. It is so much fun. Just makes me smile every time. Do you have a particular warm-up routine for the show? I don’t have a particular warm up exactly, but I did get a bit OCD about it at the Cambridge Theatre. I had this weird thing where I couldn’t set foot on the red carpet backstage that led to my entrance in the bandstand until a particular cue line, then I would do this funny dance on the red carpet before I enter. Thankfully there is no red carpet backstage at the Garrick so I have freed myself from this mad routine. Ha. What is it like backstage in Chicago? Lots of heat-packs, stretching, press-ups and pull-ups. Although I do none of these things. I can mostly be found doing a siren to get my voice ready or playing cards. I have never been in a show where each performer’s entrance carries such weight. It’s terrifying. Each time a new character is introduced to the show in the first half, the ball is handed entirely to that person. It’s just you on your own taking the stage. And I am last to enter, so the pressure is really on. It makes you raise your game. Why should everyone go and see Chicago? Because it is an iconic piece of work and it feels fresher than ever at the Garrick. I am having a ball. We have a great cast at the moment. Has anything embarrassing or unexpected ever happened to you on stage that you would like to share? Unfortunately, I once entered and fell over on stage at the Cambridge. It was full on. I enter from the bandstand up three steps and sing a very big note, but on this occasion I didn’t make it to the top of the stairs and had to leap to my feet to begin the song. It was utterly mortifying but very funny. I had tears in my eyes throughout the rest of the song because I was trying not to lose it. At least I gave the rest of the cast and the band a big laugh. It’s funny because my childhood dream was to perform in the West End. It never extended further than that. I just think I am very lucky to be where I am and hope that I continue to work, especially in new writing. My current dream is to get a nice house with a garden big enough to grow my own vegetables and keep chickens. What is it that you like most about being a singer and an actor? The camaraderie, the silliness, the feeling of singing and making people smile. I can’t think of many other professions where you can act like a child with your work colleagues every day. If you could perform a duet with anyone who would it be? At heart I love all music, but particularly, Radiohead, Bjork, Joni Mitchell. I am loving the new Florence and the Machine album at the moment and Lana Del Ray too. If you had not become an actor, what career path might you have chosen? No idea. Anything and everything, I am quite adaptable. I have a degree in English Literature, so I guess I might have become a writer. Something I still want to do in fact. But there is nothing I love more than the theatre. What do you like to do to chill out away from the West End? Sunday night is horror night in my house. I love a good horror with my mates in my lounge and some popcorn. 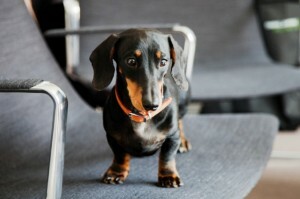 I am also currently obsessed with my puppy, Buckley (he is a mini smooth-haired black and tan Dachshund). He is sitting on my lap as we speak. He chills me out. Love him so much. I named him after Betty Buckley. She is incredible. Many thanks Russell for taking time out to answer some questions and best wishes for the future.